Vigorous and hardy, this decorative bamboo is one of the first to produce new canes each year. These canes appear in late spring or early summer and have a mainly upright habit, but do arch slightly. Their colour is green, but will sometimes have a purple flush, but over a period of several years, will fade to a yellow-green. They have a glossy finish and are clothed in rich green leaves, which cope well with adverse weather conditions. 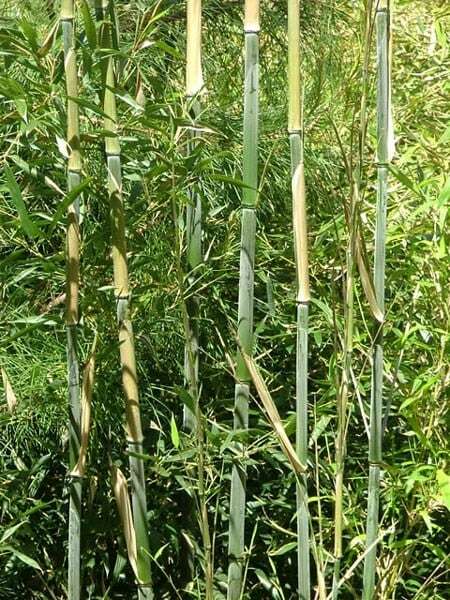 Initially forming really dense clumps, this bamboo is ideal for screening, but will spread with age. Garden care: In smaller gardens surround the roots with a non-perishable barrier that restricts the plant's spread. If potted up, it is important that this plant is watered regularly. I bought this attractive bamboo for screening and as an architectural plant. It has grown fairly quickly, and I've had to transplant it twice, as it outgrew the containers. I now have it in a long trough. It's been hardy so far through the current winter season. I love bamboo and have many varieties so this looked ideal for an additional specimen. It arrived very well packaged (if anything too much plastic wrapping) and protected but it was smaller than expected and looks very 'ordinary',. Not as anticipated but only time will tell the tale and hopefully it will mature into the image we see on here. Hello there This bamboo should be fine as long as they are kept well watered and fed as they are thirsty hungry plants. This is a fast growing bamboo which can grow to 5m x 3m wide but I would say 4 to 5 would be fine. Hope this helps. Hi there, I m thinking to plant bamboo to screen my garden, it's a very narrow garden. If I need to cover 12 meter long, how many should I go for? Is 30cm depth boarder space enough for the bamboo? That's about the max space I can leave for the bamboo alongside the wall. Please advise, thank you. Hello there Unfortunately 30cm is too narrow for this bamboo. 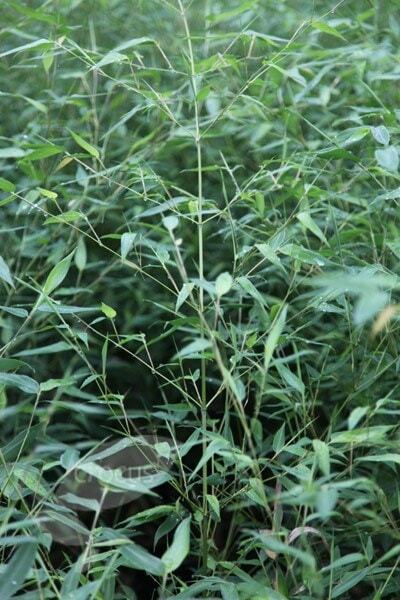 Phyllostachys bissetii is a wonderful plant but it is vigorous, with a dense, spreading habit and thick canes. Sorry to disappoint you. Hello, I would definitely opt for a clump-forming bamboo rather than a spreading on, but even these will form a clump at least 1.5m in diameter over time. Therefor, if you want to stop it coming into the garden, then you will need to use a root barrier - please click on the following link to go straight to it. http://www.crocus.co.uk/product/_/bamboo-control-system/classid.2000019273/ Keeping in mind all your requirements, I would recommend Fargesia robusta rufa - again just click on the link to go to it. http://www.crocus.co.uk/plants/_/fargesia-robusta-rufa/classid.2000017340/ The one we sell comes in a 5lt pot and will be around 80-100cm tall. It is a relatively fast grower, but as the growth rate of every plant is largely determined by external factors such as the available water, light and nutrients, it is difficult to be too specific. Hello, Even though these plants have an eventual spread of around 3m, to create a nice dense screen, I would recommend planting them at 50cm intervals. I have created a long bed across my garden which starts off in the sun but ends up under deciduous trees which are to the south east side. In the bed I planted the results of a packet of Miscanthus seeds (various varieties came up) but the last quarter or so (towards the trees) just haven't grown like the others. Would this bamboo be a substitute - I wondered if the conditions would limit their height somewhat but not stop them growing altogether? If not can you suggest something else that would continue the theme of the grasses (which are about 1.5 - 2 metres in height) but cope with partial to full shade and dryer conditions? Thanks.